The Flying Dutchmen, Collegiate’s after-school program, offers courses such as chess, martial arts, drama, technology, photography, science, cooking, hip hop dancing, woodworking, and a variety of sports. Open to students in kindergarten through sixth grade, the program runs on a semester basis. Classes are held at Collegiate and at several off-campus locations. Bi-weekly assemblies for all Lower School students take place throughout the school year. The programs vary in nature and may involve presentations by faculty members or guest speakers and music showcases featuring student performers. Each grade directs one assembly during the year which highlights classroom projects and activities. Each fourth grade student is assigned a kindergarten buddy at the beginning of the school year. 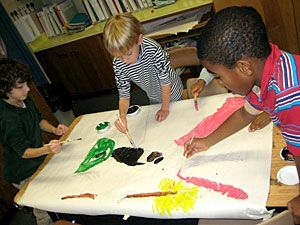 Buddies meet regularly and collaborate on a variety of projects and activities. This mentoring relationship between the oldest and youngest students in the division plays a meaningful role in each student’s Lower School experience. Community service is an intrinsic part of the Collegiate experience. As part of its mission, Collegiate is committed to guiding boys to develop habits of caring for and helping others. Lower School students participate in group community service projects and boys commonly come up with their own ideas about ways to serve one another and the wider community. Whether helping to clean Riverside Park, collecting donations for the needy, making sure that Collegiate is a “green” community, helping neighborhood and city-wide organizations such as The West Side Campaign against Hunger and City Meals on Wheels, or raising funds to support a variety of causes, Lower School students are actively involved in assisting the broader community.